Ever since I made this washi tape project (which you guys said you loved! THANK YOU!!) I've seriously been itching for my next victim to cover in washi. I've been (secretly) searching through Pinterest, pinning possibilities, and looking throughout my house for something that desperately needed some washi flair. Honestly? Couldn't find my perfect thing. Then Mother's Day came. Bwahahahaha, oh did it! Without even thinking about washi really (who am I kidding, this stuff is always on the brain) I made some yummy cupcakes, topped with delicious frosting and then placed them on their cake stands. Hmph. Not good enough. I mean, this is MOTHER'S DAY after all, and mother's need like...way fancier things. Then it hit me like a ton of washi covered bricks (which would be just the most delightful sight, really). 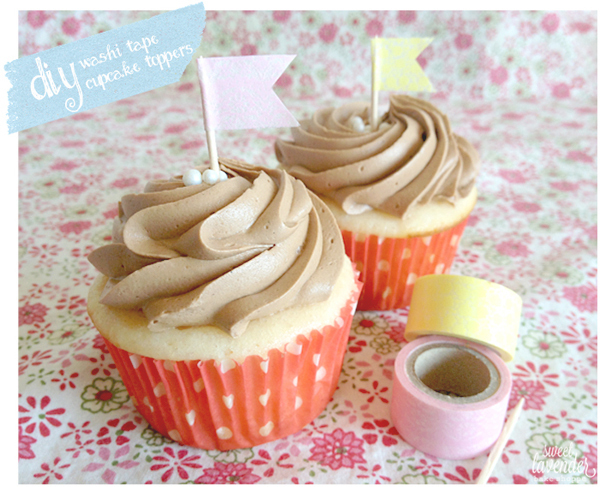 I need to make some cute little washi flags to top each cupcake with! So I did. Just for the moms. Really. I have to point out that I am so proud of my freshly painted red hot nails right here. I never have my finger nails painted because I'm so lazy- so this was a real treat! Take amount of toothpicks out that you'll need. With your washi tape, tear a strip long enough to fold over into a nice sized flag. Press directly onto one edge of your toothpick. I placed my toothpick's top flush with the top of the washi tape and directly in the middle. Carefully bring edges together, onto one side. 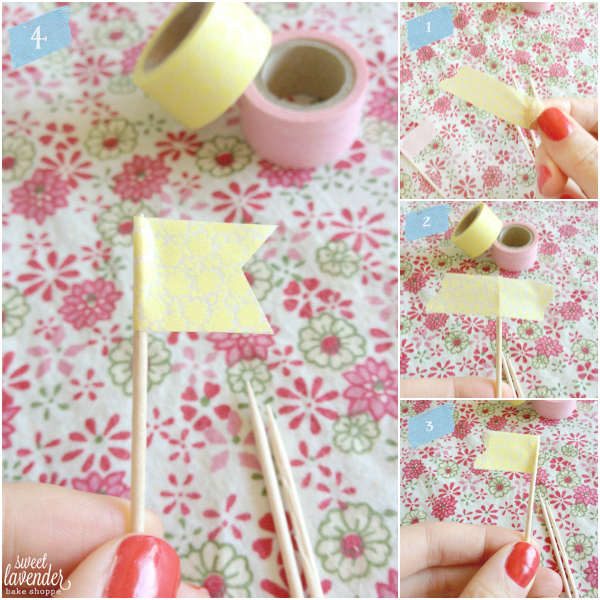 With scissors, cut middle out of the torn edge of washi, creating a flag shape! That's it! Just continue over and over until all the toothpicks needed are flag-a-fied. 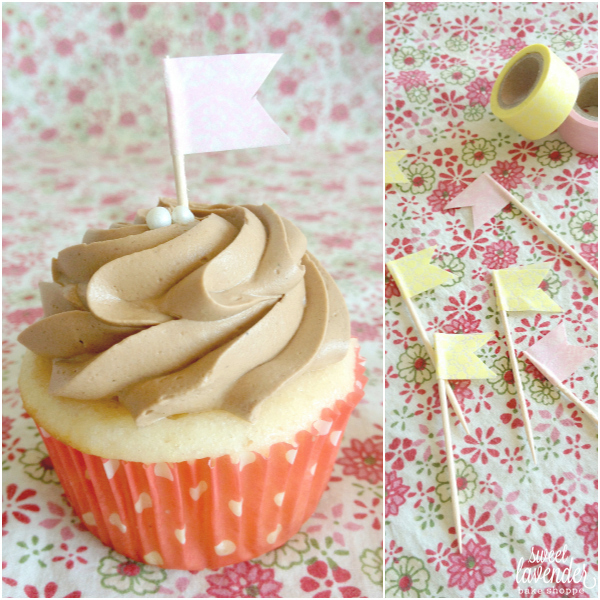 Then when you're ready, just press each flag topper directly into frosted cupcakes (or cake even)! 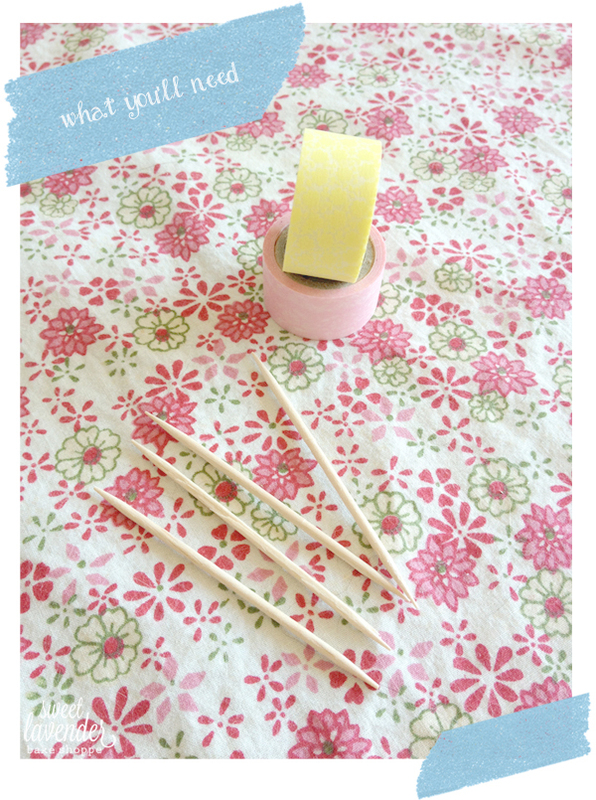 Gotta love a good and easy washi tape project! This is such an adorable idea! What a cute way to individualize them. Thank you so much Samantha, for the super kind words!!! YOU TOO! best idea ever! for real! What about a link to that yummy looking icing?